When I was at the University of Calgary, the Taylor Family Digital Library, or TFDL, had just opened its doors. As a new building, TFDL was built like you would expect a modern building to be like. The outer walls are composed of glass panes and metal frames. Inside, the main floor show off the high ceilings and open feel. There are also quite a few meeting rooms made up of glass walls that look like fish bowls. When the library first opened, the university did not really account for the need for meeting spaces, so my friends and I often camped out some of the aforementioned rooms, holding them and taking shifts as we would go in and out of classes. Whenever I was in one of these meeting rooms, I would blast music because the rooms were wired up with speakers. Meanwhile, I would occupy that room and try to get my first year engineering homework finished. Even though the speakers in those rooms were a bit lacking in quality, they were convenient and filled the room with what we wanted to hear while drowning out our academic sorrows. Now that I am in my own place, I had been looking for a new set of speakers for my computer. 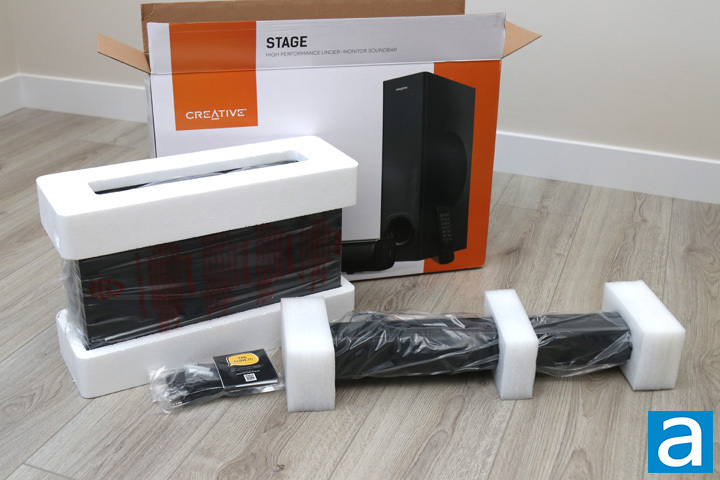 Today, Creative has possibly filled a want by sending us a soundbar and subwoofer combination in the Creative Stage. Soundbars are generally seen as a convenient option since it is only one physical object to place on your desk. However, is this set something you should put on your desk and is it capable of filling your room with your favorite tunes? I guess you can read on to find out! It has been a while since we have seen some strange looking boxes, but thankfully Creative has picked up the slack with this. Traveling from the Creative Labs headquarters in Milpitas, California, this box arrived in relatively good condition. 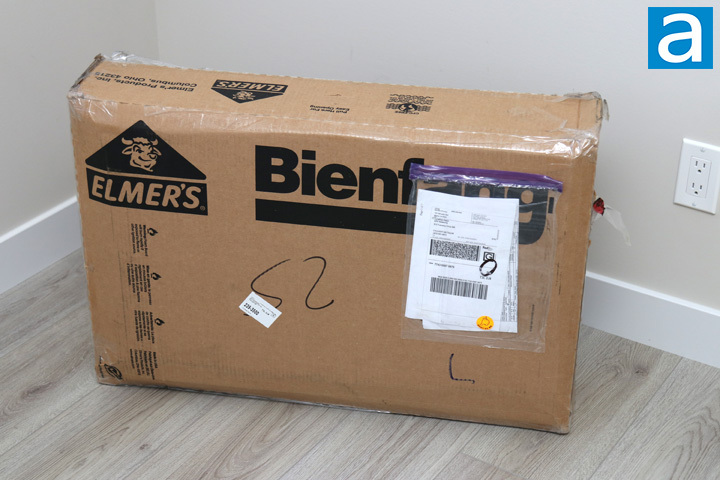 Of course, the real thing that was strange to me was the fact this is an Elmer's Bienfang box. Elmer's is not some random name, but instead the brand well known for its white liquid glue that most kids have seen and some have consumed. Taking a quick break, you will see that Bienfang actually is their line of foam boards. Thankfully, the contents were quite a bit heavier than foam board. Otherwise, you can see the whole box is sealed off well with packing tape and the Canadian border guards have not looked into this package. You could say by not opening up the box, they wanted to avoid a sticky situation. Once I pulled out the box, I was able to get a better look at the retail container for the Creative Stage. This box has a white and orange color scheme that reminds me of an orange creamsicle. Creative's logo can be found on the top left side with the product name found underneath. Creative describes this product as a "High Performance Under-Monitor Soundbar", showing it is intended to be used with a computer. However, we can see some other icons and text to represent some other notable features. The box shows off an image of the soundbar and the subwoofer inside as well as the included remote. We will take a closer look at these items later on in our review. Out of the box, we have the two major components, the soundbar and the subwoofer, wrapped in tight clear plastic bags and surrounded by foam. 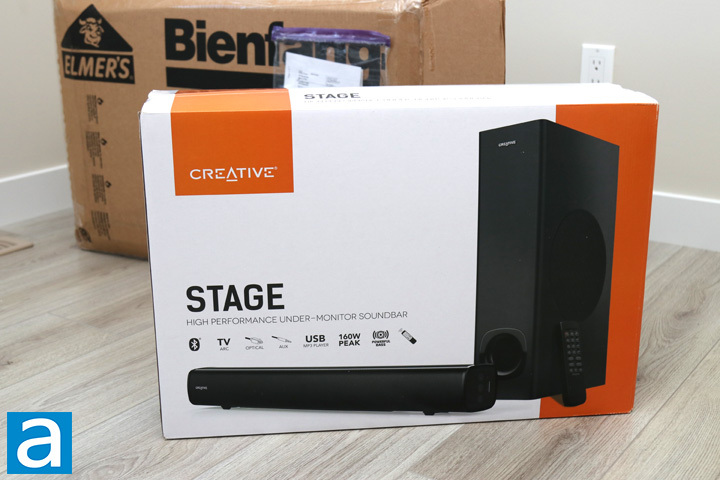 Creative also put an empty cardboard box to ensure the soundbar would stay level in transit. We also have a small bag on the side with some documentation as well as some other helpful contents. This includes the remote, 1m 3.5mm audio cable, and some mounting equipment for the soundbar. I am quite surprised at how short of an audio cable they provided, especially since 1m barely covers the distance between people's monitors and their computer towers. This is way too short and Creative just needs to provide a longer cable. For those wondering, the Creative Stage set is covered by a one year manufacturer's warranty. posted 3 hours and 25 minutes ago, with 1 posts. posted 3 hours and 26 minutes ago, with 2 posts. posted 3 hours and 26 minutes ago, with 8 posts. posted 3 hours and 27 minutes ago, with 7 posts. posted 3 hours and 31 minutes ago, with 15 posts. posted 3 hours and 31 minutes ago, with 59 posts. posted 3 hours and 31 minutes ago, with 14 posts. posted 3 hours and 31 minutes ago, with 11 posts. posted 3 hours and 32 minutes ago, with 11 posts.